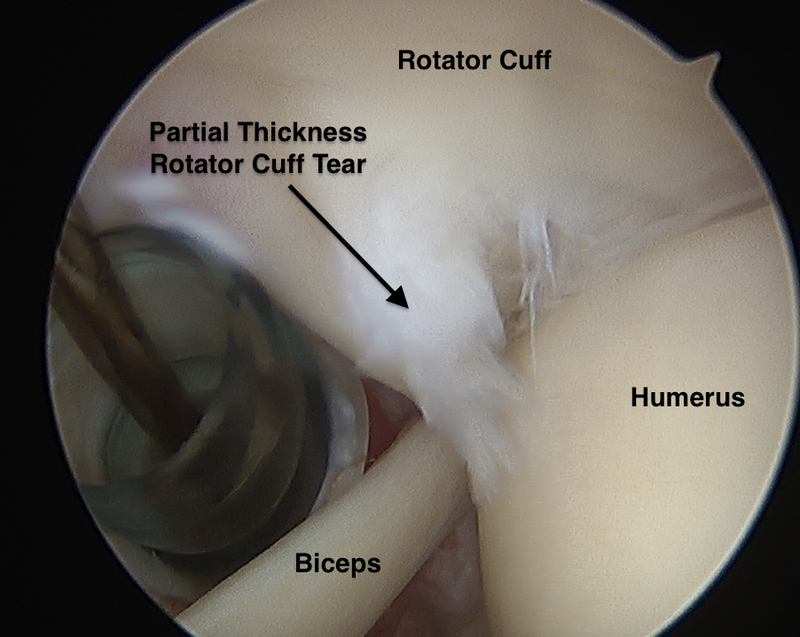 Partial Thickness Rotator Cuff Tears (Video) - Jeffrey H. Berg, M.D. Partial thickness rotator cuff tears are a unique type of rotator cuff injury. 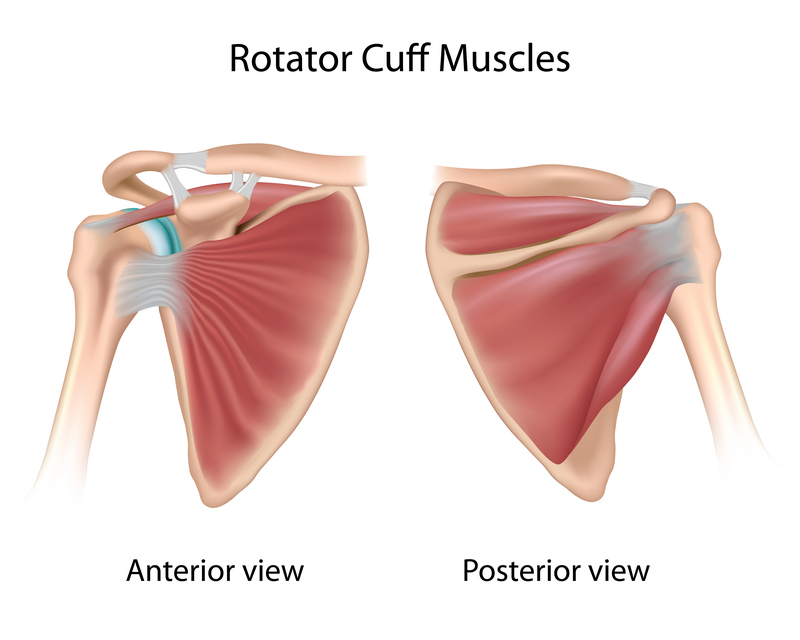 As you may recall from an earlier post, the rotator cuff is a group of four tendons. These tendons start on the shoulder blade as mostly muscle and then extend out to the upper arm (humerus) where they attach as a combined group of tendons (“cuff”). The rotator cuff tendons are deep in the shoulder and are critical for normal shoulder motion and strength. Essentially, when the muscular end of the tendon shortens, it pulls on the tendinous end, moving the upper arm and your shoulder. When there is a rotator cuff tear, this function can be impaired. This can lead to shoulder pain, weakness and sometimes clicking or popping. In addition to a number of other features, rotator cuff tears are characterized by whether they are “full thickness” or “partial thickness”. Tendon insertions have a certain length, width (front to back) and thickness (top to bottom). Whether a tear is full or partial thickness logically refers to how much of the thickness of the tendon’s insertion is involved. A tear that includes the entire humeral insertion and therefore its entire insertion’s thickness, leaves the tendon no longer attached to the humerus. This type of tear is called a full thickness tear. Tears that only involve a portion of the thickness of the tendon attachment and therefore leave some of the tendon still attached to the humerus are called partial thickness rotator cuff tears. What makes partial thickness rotator cuff tears unique? Like other tissue, and really almost any living or nonliving object, our rotator cuff wears over time. This means that as we age, our rotator cuff will show some degeneration, some fraying and some cracks. These changes are essentially partial rotator cuff tears. Many of you in or beyond middle age have partial rotator cuff tears. That includes those of you with absolutely no shoulder pain. Any tear of the rotator cuff other than a 100% thickness tear can be classified as a partial thickness tear. That means a 1% tear and a 99% tear are both partial thickness tears. These however are dramatically different. The likelihood that a partial thickness tear is symptomatic correlates with the amount of the thickness involved. The greater the involvement – the more likely it’s symptomatic. So there are partial thickness rotator cuff tears and THERE ARE PARTIAL THICKNESS ROTATOR CUFF TEARS. All partial thickness rotator cuff tears are not the same. With age, our tendons develop microscopic injuries which we can’t always fully heal. Therefore, over time, our tendons will often accumulate damage. This tendon damage is called tendinosis. Although tendinosis may exist, it is often simply like another age related change – graying hair. Like gray hair, tendinosis is also often asymptomatic. On an MRI, low to moderate partial thickness rotator cuff tears and tendinosis look the same. So, frequently the diagnosis of a partial thickness rotator cuff on your MRI report is unhelpful. It could simply be asymptomatic tendinosis. Furthermore, even if you have a partial thickness rotator cuff tear, that tear may not be symptomatic. In fact, over 50% of people over the age of 60 who have no shoulder pain are reported to have partial or even full thickness rotator cuff tears. As a result, if you’ve been told that you have a partial thickness rotator cuff tear, you may or may not have found your problem. As we discussed, if you have been told that you have a partial thickness rotator cuff tear, you may have nothing more than typical aging of your tendon. Furthermore, the tearing could be minimal and irrelevant. Finally, what’s thought to be tearing, may be nothing more than tendinosis…just asymptomatic tendon degeneration. As a result, the diagnosis of a partial rotator cuff tear often means nothing. Hearing from your orthopedist that you have a partial rotator cuff tear is often like hearing from your dermatologist that you have wrinkles. There’s nothing to do. 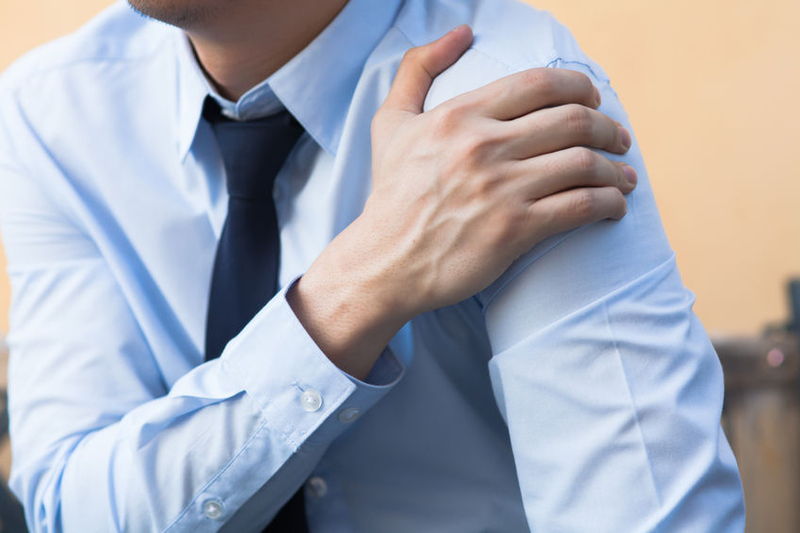 With that said, some partial rotator cuff tears are symptomatic…and do require treatment….but even in those cases, they don’t always require a repair. This is a confusing topic…even to shoulder specialists. In this installment of the Two Boneheads video series, Dr. Howard Luks and I try to clear things up. Watch us discuss the topics covered above as well as the treatment options for symptomatic partial thickness rotator cuff tears. After watching, I hope that you will better understand this controversial topic. If not and you have further questions, let me know.